Instant Pot Chicken Enchilada Pasta is a quick and easy one pot dinner you can make in your pressure cooker in about 30 minutes. 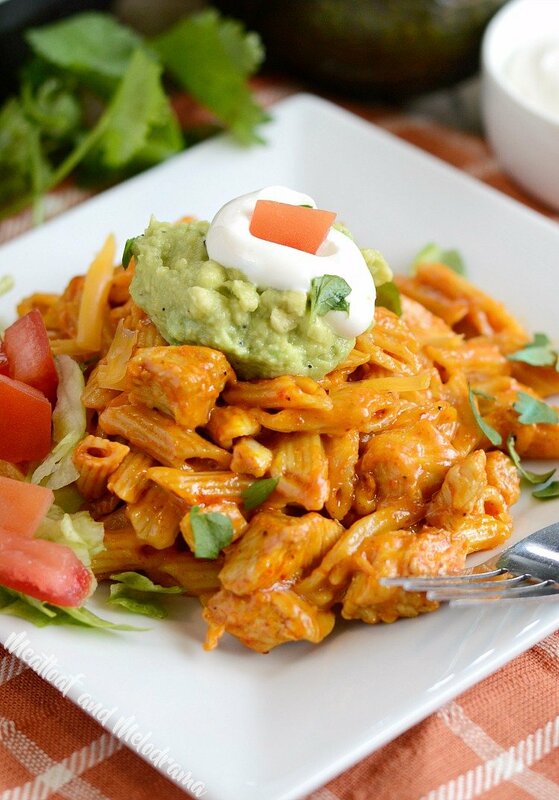 If you like Tex-Mex flavors, you’ll love this creamy, cheesy enchilada pasta recipe! Can’t decide what to make for dinner tonight? Are you torn between Mexican food and pasta? Can’t deal with dishes tonight? 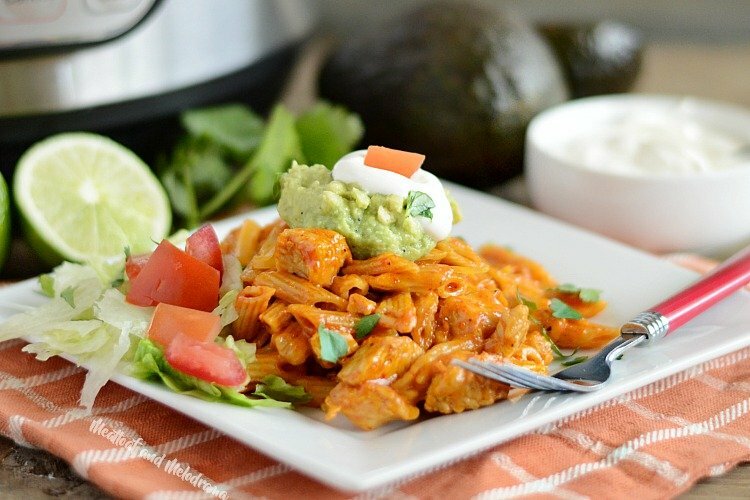 You guys, you are going to love this easy one pot pressure cooker chicken enchilada pasta! If you know me, you know how much I love making one dish dinners. 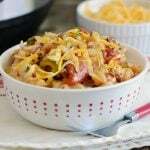 So, I’ve been working to convert my regular one pot dinner recipes into one pot Instant Pot recipes. It’s a tough job, but someone has to do it, right?! 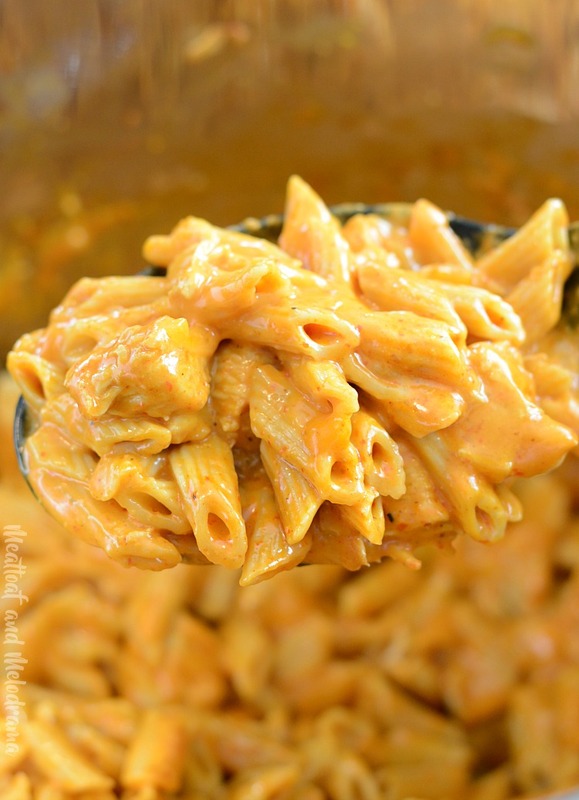 One pan creamy chicken enchilada pasta is one of our favorite dinners, and it wasn’t hard to make it in the pressure cooker. The only real difference is the amount of ingredients and the cooking method. Usually when I make one pot dinners in a skillet, I use less pasta because it there’s not a lot of room. Since I have an 8-quart electric pressure cooker, that’s definitely not an issue! This is a super easy recipe, and you can throw it all together in just a few minutes. 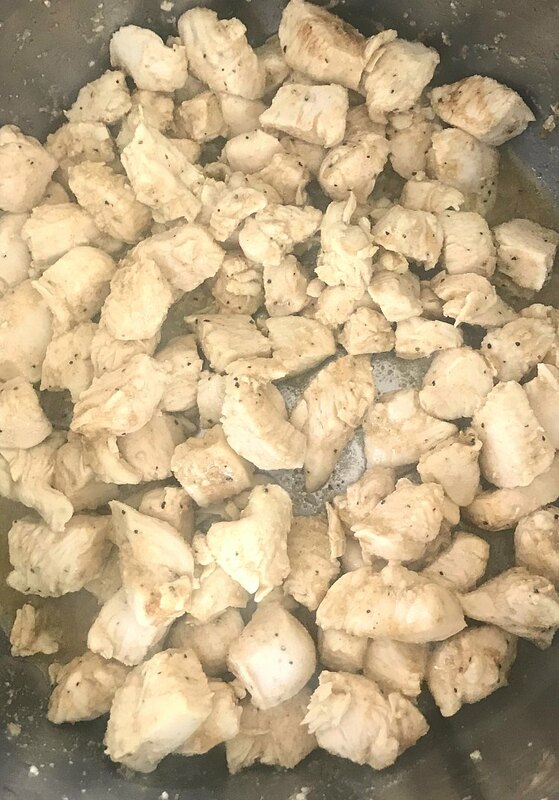 Just cut up your chicken, and cook it in the Instant Pot until no longer pink. Waiting until the pot is hot to add the oil and chicken definitely helps keep the meat from sticking. If you do have any meat stuck to the pot, just deglaze with a little water or chicken broth before adding the remaining ingredients. Then, you add the rest of the ingredients, and pressure cook it for 4 minutes. 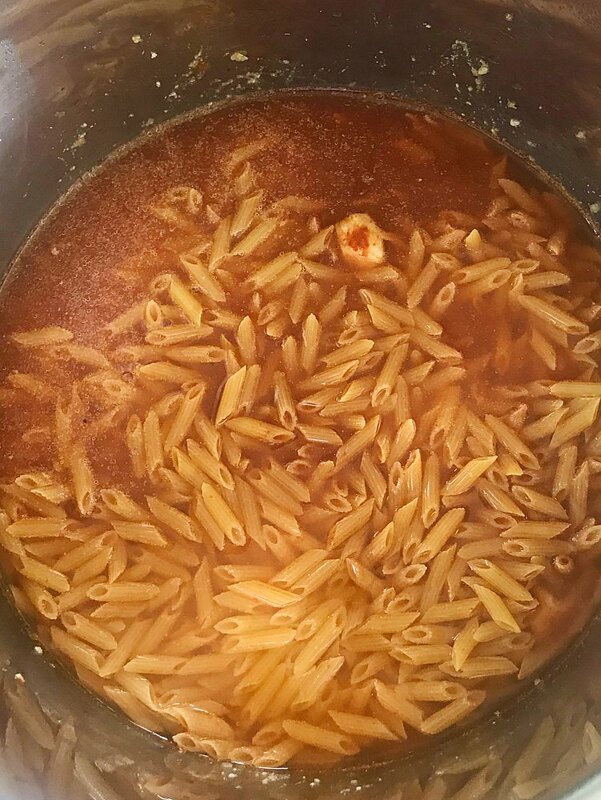 I like to do a gradual quick release when I make pasta in the Instant Pot. It just keeps liquid from spurting out everywhere. I also add a cup of cream to the pasta after it cooks. This makes it a little creamier and helps cut down on the heat since not everyone in the family can handle the spice. Then, you stir in some shredded cheese, and you are ready to enjoy this creamy, cheesy chicken enchilada pasta! You can add your favorite enchilada toppings for extra flavor. I like to serve it with homemade guac or avocados, tomatoes, and sour cream — and maybe even a few crushed tortilla chips on the top for added texture. 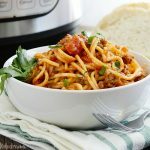 Looking for More Instant Pot Pasta Recipes? You can see all of my pressure cooker recipes under the Instant Pot tab on the main page! Add chicken, and cook until no longer pink, stirring frequently so that chicken doesn't stick. Add sea salt, onions, cumin, garlic powder and pepper, and stir to evenly coat chicken. When pot beeps, hit CANCEL, do a gradual quick release, and when pin drops, open lid, and stir. Recipe was made in an 8-quart electric pressure cooker. For spicier pasta, substitute additional 1 cup enchilada sauce for 1 cup of the water. Can also omit heavy cream if desired. 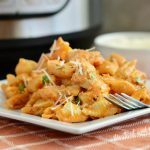 My family loves this Instant Pot chicken enchilada pasta for dinner or a weekend lunch. I hope you enjoy it as much as we do! I have been hesitant to try pasta in my new IP. I’ve been waiting for a recipe that grabs my attention. This one is happening asap! This looks perfect and easy to make! I am loving everything about this. The flavor sounds amazing! I love cooking pasta dishes in my IP! So easy and always a hit! This pasta is making me so hungry! Looks tasty! Love the flavors going on in this! Such an easy dinner for busy weeknights! I FINALLY just got my IP and now know what to cook first! This is a delicious Instant Pot Recipe! Thanks so much for sharing your awesome post with us at Full Plate Thursday. Have a great week and come back soon! This was really good and easy. I had leftover rotisserie chicken so I used that. It was a little too saucy (and I love sauce) so I think next time I will use only 1/2 c cream. Great recipe, the whole family loved it went back for seconds.